Norbert Hofer of the Austrian Freedom Party concedes defeat to Alexander Van der Bellen in presidential election. Austria's Norbert Hofer on Sunday conceded defeat in his bid to become Europe's first far-right president, as projections showed he was lagging behind in the election re-run, reports AFP. Greens-backed independent Alexander Van der Bellen swept 53.3 percent of the votes against 46.7 percent for his rival from the anti-immigration Freedom Party (FPOe), according to public television projections. 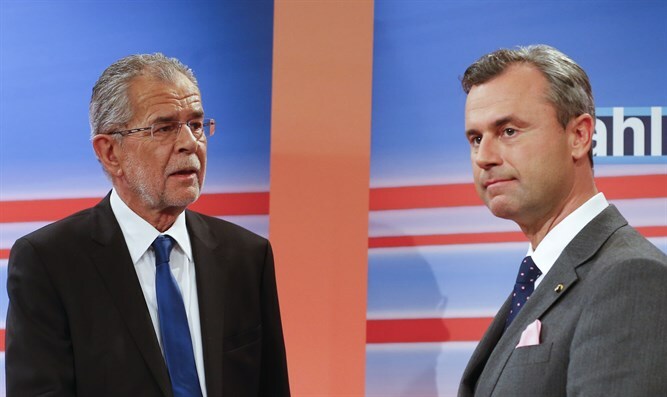 The outcome deals a crushing blow to Hofer who narrowly lost to Van der Bellen in a first runoff in May. "I am incredibly sad that it didn't work," the 45-year-old Hofer said in a message on Facebook, according to AFP. "I congratulate Alexander Van der Bellen on his success and call on all Austrians to stick together and work together," he added. The official result of the election, which lasted nearly a year, is not expected before Monday when postal votes will be tallied, the report noted. Nevertheless, the Freedom Party conceded defeat within minutes of the poll projections being released, shortly after voting ended. Hofer had vowed during the campaign to "get rid of the dusty establishment", seek closer ties with Russia and fight against "Brussels centralizing power". Some 6.4 million Austrians were eligible to vote in Sunday's election. FPOe chief Heinz-Christian Strache said his party would not contest the outcome this time. "Of course it's disappointing for me... I was hoping for more," he said, according to AFP, while stressing that the result was nonetheless "a historic result" for his party. In its journey from a fringe movement 15 years ago to the mainstream, the Freedom Party, which opposes immigration from Muslim countries, has sought to downplay its racist and anti-Semitic reputation. Strache apologized in 2012 for posting on Facebook a caricature depicting an obese, hook-nosed banker wearing star-shaped cufflinks. Strache's predecessor, Joerg Haider, praised Nazi employment policies and the Waffen-SS. Freedom Party lawmakers often have attended and spoken at events commemorating Nazis, including a gathering in memory of an Austria-born Nazi fighter pilot who shot down 258 planes, while Strache himself had been accused of using a little-known Nazi salute in 2009, which he denied. Strache visited Israel this year and met with officials there. He said he supports Israel’s fight against radical Islam and has argued he has purged his party of anti-Semitism.